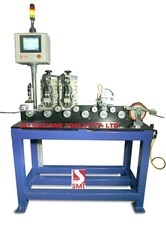 Our product range includes a wide range of flat dripper servo perforation machine. Suitability For pipe wall thickness range 0.15 to 1.2 & pipe OD range 12-20 mm. Outer Diameter Range 12-20 mm. One station /Perforation unit can punch up to 600 drilling per minute. A specially designed sensor provides accurate and repeatable for each incoming dripper. Digitally mechanism to the position and speed of the drippers. The position of the hole is adjustable by LCD & touch screen for ease of operation. The operation interface provides easy access and display of the set and actual dripper spacing min/max spacing alarm toluene pipe length and dripper counters. Vision system for pipe drilling performance.